What makes for the best action scenes? Anime or manga? Depending on your personal preferences your answer will vary. In my case however, the answer is not likely to change any time soon. Why? You may ask. Because when the comparison is between cycled frames of animation versus engaging, motion without motion, manga there really is no competition. Of course I’m being unfair to anime, that’s what happens when one generalizes. The moral of the story is that you should never generalize. Unless of course you’re right. But you have to be able to prove you’re right, which I intend to do. The first thing to consider is that manga is at a disadvantage to anime when it comes to showing motion. And baring Shueisha being bought out by the Daily Prophet, I don’t think we’ll be seeing this change any time soon. So instead manga has to rely on the reader filling in the blanks between panels. Such as when Toriko punches a hole in a Rock Drum’s hands, or when Sunny sends another Rock Drum (giant stone covered crustacean type monster) flying. We do not see the motion from point A to point B, instead we see point A and then point B, and sometimes we get to see point A 3/4. But because of the beauty that is the human mind we can extrapolate what happens in between, thereby creating a full range of motion. Reality cannot compare to what we ourselves imagine in our minds, and accepting that as true means that anime has to compete against (to us) the greatest thing ever created. If the individual points are executed well enough, we elevate the whole action by imagining it for ourselves. It becomes personal to us, and because it is ours, it is clearly superior to any other version. Anime does not have that so called disadvantage. It has no choice but to show every step between point A and point B. Unfortunately this not only costs money, meaning sometimes unfortunate cost cutting measure have to be used, but it also has to compete against the version we created in our mind after reading the manga. It really just can’t win, especially with the budget of a weekly series that is only eleven episodes in (the One Piece crossover does not count). It isn’t quite in the spirit of reviewing manga per-say–most reviews I’ve seen focus on the manga rather than making comparisons to the anime–but I felt like I needed to mention this. As a manga purist my bias is against anime. I still love the anime versions of my favorite manga, unless of course for some reasons the animators decide to start messing around, but the original is always the best for me. This is why the One Piece manga is better than the anime, and why the Cowboy Bebop manga isn’t nearly as good as the anime. The superior product tends to be the original product. That’s not to say that adaptations can’t improve on the original, but as far as anime and manga is concerned I have yet to see it happen. Normally when people consider action and movement, it makes sense that the medium that actually moves would be superior. 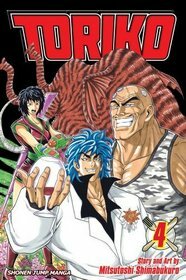 But oddly enough, especially comparing the two versions of the fight between Bei’s GT Robot and Toriko, the manga does a much better job showing not only the action, but also the danger faced by Toriko against the robot. Part of this is because the anime has to cut down on the graphic violence, so we don’t get to see a chunk of Toriko’s arm sliced off, but also because action sequences seem to be the go to spot for cycling animation. What in the manga is a single panel, maybe two, suddenly becomes several seconds of time in the episode that doesn’t advance the story. And this volume is all about movement. Robots get blasted away or crushed. Rock giants get tossed around like rag dolls. Boulders get reflected back. Things are moving, and they are moving well. This includes the plot. Picking up the pieces from the battle in the arena, Toriko and friends move into Biotope 1, in search of the Regal Mammoth. Not only are the villains given proper focus, but a new character, Sunny, is introduced. This is what shonen adventure series are all about, epic one on one fights, life and death quests. Heroes being thrown into dire circumstances. Sure it may sound like a familiar tune, but it is being played on a new instrument. The stakes are raised, and the story deepens, and it’s only the fourth volume. Some series take much longer than that to introduce an ongoing thread. But for Toriko this is the perfect place. After three volumes of showing us what the formula is, now it’s time to take that formula and to have some fun with it.